XYZT is an immersive art exhibition comprised of 10 interactive virtual environments generated using math and physics models. In a darkened gallery, guests use their own movement and gestures to interact with light in a series of digital landscapes inspired by nature. 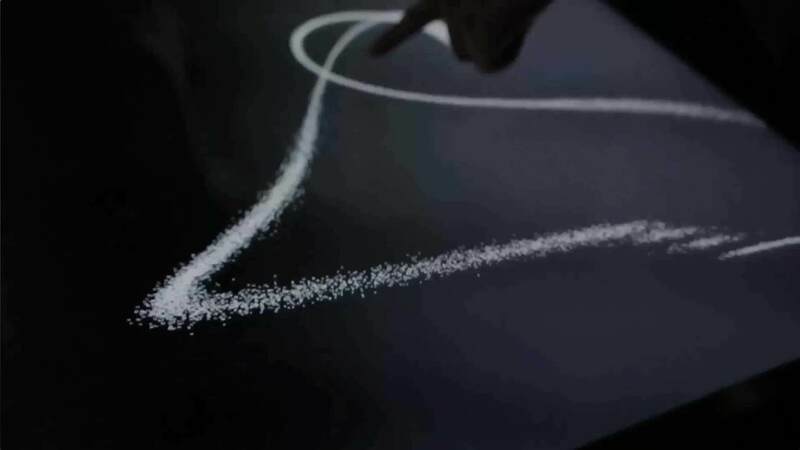 Specific sensations, such as walking in the grass or putting your hands into the sand, are transposed into abstract, sensory encounters with lines, dots and letters. XYZT creators Adrien Mondot and Claire Bardainne, French artists/performers/computer scientists, describe the installations as "a journey through nature revisited." Each letter in "XYZT" identifies the movement of a point in space - horizontal (X), vertical (Y), depth (Z) and time (T). The experience melds playful exploration with scientific reasoning, as each installation is accompanied by a video label on the nature of the underlying physical behavior, complete with excerpts from related dance performances. Share your impressions with us on social media using #XYZT. XYZT: A Journey in 4 Dimensions was created by Adrien M & Claire B Company and originally titled XYZT—Abstract Landscapes in 2011 and revisited in 2015. This exhibition is made possible by the generous support of the MCUFEU – Cultural Services of the French Embassy in the United States, The Applied Materials Foundation, Fay, Susan and Appy Chandler and Mr. and Mrs. J. Taylor Crandall. The East India Marine Associates and members of the Art & Nature Committee of the Peabody Essex Museum provided additional support.